Hiking in the fantastic Highlands of Scotland. along a repeatedly changing natural landscape. Past picturesque waterfalls and old bridges, that combines impassable terrain together. from time immemorial of the Skoten, before Scotland got its name. with their interesting stories about power struggles and conquests. At every turn you can learn the ancient Scottish history. We help you to experience this wonderful country in all its diversity. A Scotland outside the usual tourist routes. 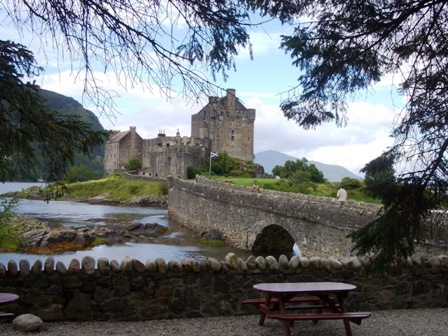 An old Celtic and romantic Scotland full of magic and mystic. Together with you we plan your individual Scotland tour. whether alone or in a small group. Whether by car, caravan, bicycle or by afoot. For almost twenty years I have, in every season, hiking in this beautiful country. The Highlands have become my "home". by car or by caravan through the Highlands of Scotland. Sightseeing of castles and national monuments. Four-day hiking-trip, alternatively bike tours, to remote glens of the Highlands. in a tent, in caravan or in a locally B&B. Including the island tours "Isle of Skye" and "Isle of Mull" with the Celtic is land of kings "Iona". to the Celtic roots of Scotland when it was called "Dalriada". Six-day hiking trips, alternatively bike tours, to the remote glens and to popular lochs of the Highlands. Individual overnight that depends on the season, in a tent, in a caravan or in a locally B&B. We look forward to your e-mail or your call.